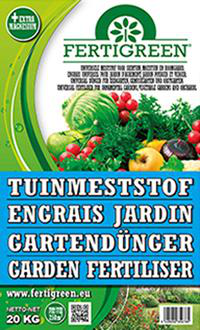 Fertigreen garden fertilizer is a universal composite mineral NPK fertilizer to fertilize lawn, ornamental garden, vegetable garden and orchard. Due to the rapid and direct action of the garden fertilizer we obtain a higher yield in the vegetable garden, improves the quality of plants and resistance to disease goes on ahead. Contains magnesium for proper chlorophyll operation. The present sulfur content provides a better initial development of proteins, amino acids and vitamins in the plant, and also promotes the effect of nitrogen. Best evenly sprinkle a few days before sowing or planting. Then the fertilizer with topsoil mix to a depth of 8 to 10 cm. 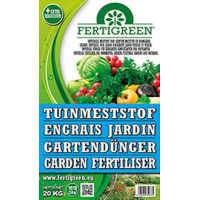 During the growing season, and according to the specific needs of the plant, spreading Fertigreen garden fertilizer. If possible, ornamental garden, vegetable garden border and the grains lightly soak. Preferably fertilize if rain is expected, for the spraying or in a damp soil. NOTE: Although the above table was compiled very carefully, it is only indicative and may, on the basis of the information no rights.